So, it looks like my goal for each Slam is to ensure that my preview is last. I honestly am not trying to, I swear. Let's take a look! 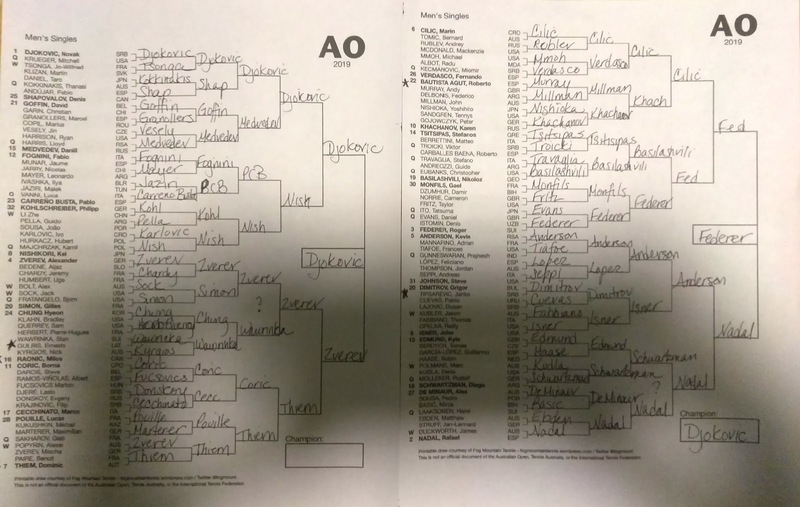 So, I picked Novak Djokovic to win the tournament and a lot of it has to do with the uneven weight of the draws. Sure, Kei Nishikori could come in and show that U.S. Open run-skills from a couple years ago. Meanwhile, Roger Feder has a LOT in his draw. Technically that half belongs to Rafael Nadal, but, as usual, Nadal is recovering from a late-season injury. (Last season was like, three weeks ago. Just for perspective.) Nadal could come out shooting, but man, I see his potential match against Diego Schwartzman and I get some very traumatic flashbacks from the French Open last year. We will see. Milos Raonic v. Nick Kyrgios: The first round. OK. Got it. Benoit Paire v. Dominic Thiem: Thiem, yeah, but still should be fun. Roberto Bautista-Agut v. Andy Murray: Given what we now about Murray's condition, I just can't bring myself to write on paper that Murray could get topped in the first round. So I wrote "Murray." I'll take the hit. Janko Tipsarevic v. Grigor Dimitrov: This seems like a good upset pick.